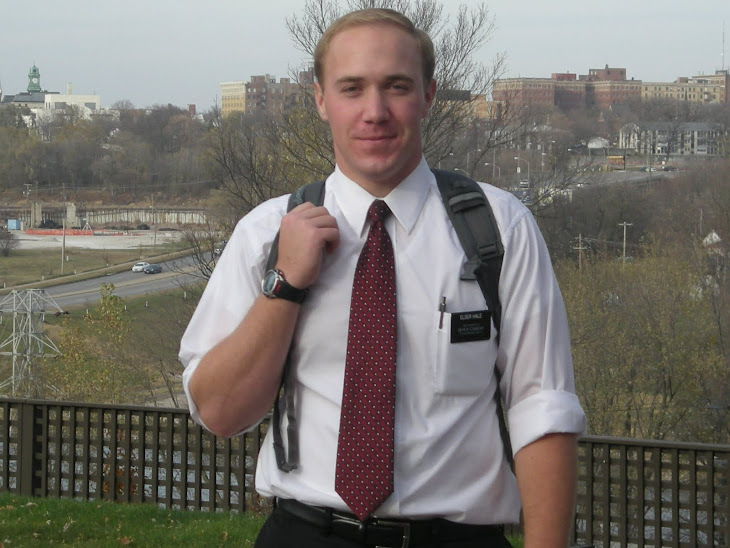 This last week was the last week of this transfer, so Saturday we got word from president that I would be staying here in Clinton and Elder Eldredge is going to be moving on somewhere else, he is also going on to be a zone leader. So Wednesday I will find out who exactly my next companion is going to be. I get to go to transfers, so this Wednesday I will be in Peoria Illinois. 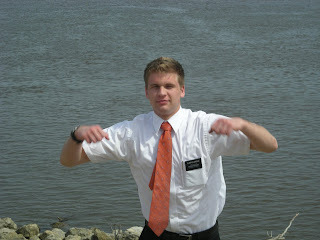 There is also going to be a new Elder coming into our district, besides the one I'm getting. Clinton is doing good though. 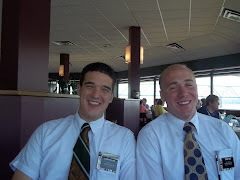 Saturday Elder Eldredge and I were fed by another investigator. Their names are Quinton and Melissa. They have a little family with 3 young girls. So we invited Bro. Estes and his family to come with us to the BBQ. Bro. Estes has three small children and they were the exact same age as Quinton and Melissa's kids. So the fellowshipping begins. The BBQ went so good that we finally got them to come to church! We have been working for them to come to church for a month now. Needless to say that we are going over for another BBQ this Saturday. So we finally were able to get some new investigators to church. It was funny because the day before all this happened I got Dad's letter about getting members over to meet the investigators to help get them to church. Mother I need some shirts. I've been putting this off because of transfers because I did not know where I would be going, but now that I'm staying here I would like to ask you if you could send me 5 white shirts, short sleeve, its a 16.5 collar, the wrinkle free ones if you can. Thank you. I'm about ready to send the tape, well actually it's 2 tapes, they are real good. Thanks for the letters this week, I like to hear what you guys are up to. How is Michael doing? Roxanne, write me! Elder Eldredge is bummed that you didn't write him, but you still can, you just have to sent it to the mission office in Peoria, mom should have the address. I LOVE YOU ALL hope to hear from you. 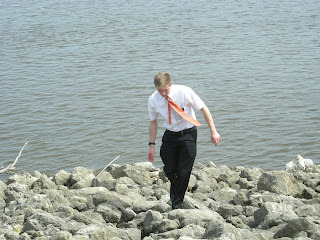 Is the Mississippi River visible as you are 'round about town? What is one thing you would scramble to fix or clean in your apartment if you saw Sister Erickson walking up to your door? It's dirty dishes, that would be a must. I'd just start throwing them into the oven or something. Have you had to get a haircut since you got to Iowa? Yeah, I've had 2 haircuts since I've been here in Clinton. I had one in the MTC and two here, one about every transfer (6 weeks). On a scale of 1-10, how well are you eating when you have to cook for yourself? Well, it's gonna be a 4-5. We eat pretty good on the left-overs from members, but the food we make ourselves really is not very good, mostly entails using the microwave. In the works. We are producing it on the tape, so I'll send it pretty soon! I didn't get a letter out this week, but I did send out that question thing that you sent me a while back. I'm making a tape with a new hit jingle, produced by Elder Eldredge and me. I had to get Elder Eldredge on the tape because this week is the last week of this transfer so I don't know if I will be here or going somewhere else. We are most likely going to be split up after this week. 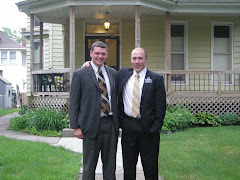 Not many missionaries stay together more than 12 weeks. I received your pictures in the mail, it was really great to get them. This week was another disappointing week. We mostly focused on follow-ups, catching up with new investigators and meeting with people for the first time after they had offered to have us over when we found them out on the street. Many appointments fell through. It's been like this for the last 2 weeks after we had our last power week. Yesterday we were supposed to have 5 people come out to church, but none of them did. It gets so frustrating when you're trying your best, but no one else will keep their end of the bargain. We have a baptism date set with Mitch, the MMA fighter. He is a really solid guy and loves when we come over to talk to him in his gym. 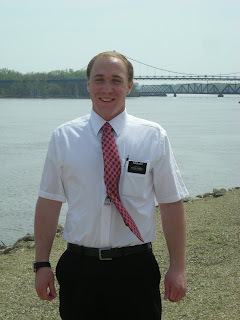 He loves the story of Joseph Smith and is always talking about him. He feels like that story describes him to a T. We might have to move his baptism day back a week because he didn't come to church yesterday. We are also teaching a woman, Amanda, I think I was talking about her in the past. We had a very good lesson with her at the Near's home (members in the branch). They have agreed to teach her in their home. So we taught her and really helped her recognize the spirit. She had been feeling it there while we were teaching her, she recognized it, but did not know what it was. So we helped her know what that feeling she was having was. When she was describing what she had been feeling throughout the lesson, she pointed at me and said that she felt it a couple times when I was talking. That was the first time anyone had said something like that to me, it hit me really deep to be told by someone that they had felt the spirit when I was talking. I just got back from Davenport from Zone P-day so that's why I'm getting this out a little late. Thanks so much for the tape and the Easter Basket. General Conference isn't the same without candy. I also got a few other cards and packages from the ward family, it was great to hear from them. I'm putting a tape together right now with some good stuff on it. I'm still working on getting the pictures you wanted and the questionnaire you sent me, but it's in the works. Hey, in general conference I heard that in the next 3 months there will be a temple dedicated in the Phoenix area, is that right? You need to send me a picture of it when it's all done. This week has been really crazy. We had a ton of appointments and follow-ups to do, but just about everything fell through. It seems like every time we can get a member to go with us, no one is home or they call and cancel. We also had zone conference this last week so that meant another trip down to Nauvoo, which is always fun, just a long drive. Tomorrow we have an appointment with a new investigator, her name is Amanda. When we taught her it was one of the most powerful and spiritual lessons that we have ever taught being here in Clinton. She wants to be baptized and so we are going to teach her in a member's home tomorrow with some solid members. We also have met a real cool lady named Makeena, she always is asking us really deep questions and always wants to learn more. We have a appointment lined up this week also with a member. We are trying this week to get the members involved with most of our appointments. So just keep them in your prayers that all goes well and we will be able to meet with them. Conference was SWEET. I have never been so spiritually fed in my life. There was a lot about teaching youth, but some good missionary stuff as well. Hope you all had a wonderful Easter. I wish I could write back about some of the things you told me in the tape, but I'm running out of time. I'll try and shoot you a letter this week.